When the floor beneath your door is uneven, which is generally a problem in older homes, it's difficult to seal the bottom against the threshold to keep drafts out. A door sweep is designed to push against the threshold while bracing against the bottom of the door, but an uneven threshold can create a gap. To fix this problem, affix the door sweep to the door at an angle so that the vinyl fins of the sweep are parallel with the floor, not the door. 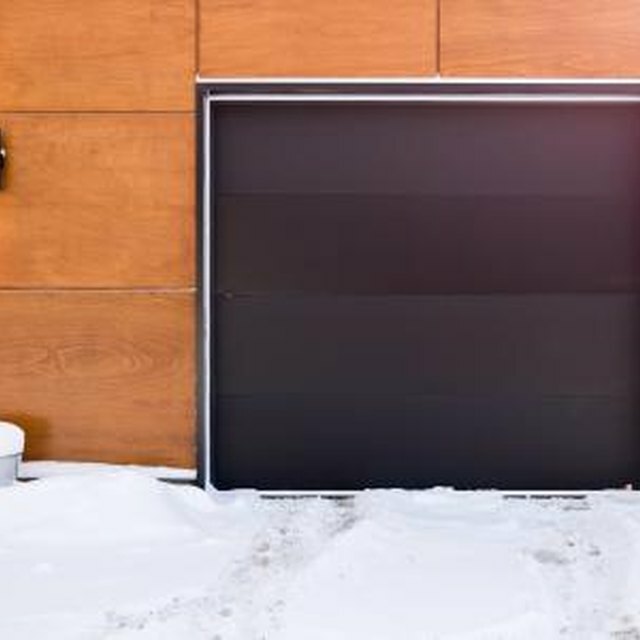 A well-sealed door will help you better regulate the temperature in your home. Measure the width of the door and measure the space between the bottom of the door and the threshold on the left, center and right of the door. Because the floor is uneven, you will get three different measurements. Use the smallest of these measurement at the home improvement store when selecting the size of the door sweep. Cut the door sweep with a hacksaw to match the width of the door. Smooth out the rough metal with a rasp. Insert the U-shaped metal sleeve of the door sweep along the bottom of the door while it is open. Press the door sweep up until the entire sleeve is flat against the bottom of the door. Close the door and crouch down to look for any gaps. If no gaps are evident and you can open and close the door without any drag, move to Step 6. Look for a gap on the side of the door where the floor is lowest, and then open the door again. Push down on the metal sleeve until it moves a fraction of an inch lower. Close the door again and check for gaps. Maneuver the door stop until you cover the gap and the door opens and closes well. The door sweep will be parallel to the floor rather than the bottom of the door. Make marks in pencil where the screw holes are located on the door sweep. Remove the door sweep and drill pilot holes with a drill bit appropriate for the size of screws. Replace the door sweep and align the screw holes with the pilot holes. Insert screws through the holes and tighten them with a screwdriver. Start with the center screw, and then tighten the outermost screw on each side. Attend to the rest of the screws until the sweep is firmly in place and the screw heads are flush with the metal sleeve. Test the door a few more times to ensure it works properly and there are no gaps at the bottom.